Leicester has welcomed the Queen many times during her 60-year reign, most recently on Thursday when thousands turned out to catch a glimpse of the monarch as she embarked on her Diamond Jubilee tour. 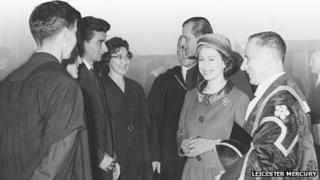 The young Elizabeth had been on the throne for six years when she paid her first official visit to the city in May 1958. Leicester has since gone through decades of cultural and economic transformation. Have royal visits changed to match the evolving identity of British cities? When the Queen came to Leicester on 9 May 1958 she arrived at Victoria Park to inspect a guard of honour. She went on to open the Percy Gee building at the University of Leicester - the university was much smaller and then had fewer than 1,000 students. Leicester was known as a major economic centre for engineering, shoemaking and hosiery production and the Queen visited hosiery and textile manufacturer Corah during her trip. She also visited Leicester Town Hall and the music and performance venue De Montfort Hall. One student gave Prince Philip a US airman's boot, reportedly as a dare so the prince could become an honorary member of the university's Yeti Club. And another undergraduate, Wendy Hickling, said she was lucky enough to spend a few moments chatting with the Queen. Now 75 and living in Great Glen, Leicestershire, she also met the Queen when she opened a new library at the university in 2008, and said royal visits had become less much less formal over 50 years. "I was asked to talk to her and you feel like asking how she has been doing since the last time we met," she said. "I was sitting looking at this photograph [from 1958] where everybody is wearing gowns and everybody is stilted and upright and standing to attention. I was very nervous then. "The contrast between that and when the Queen came to open the new library was so different. It was so much more relaxed. "In general all of the royal visits are much more tuned to the people. I suppose it's how the world has changed. "She's another being and people are very fond of her but aren't in awe of her as we were fifty years ago. "Earlier on one would not have dreamt of meeting the Queen without wearing a hat, but now that's not required of you in most circumstances." The Queen and Prince Philip were joined by their granddaughter-in-law the Duchess of Cambridge when they visited Leicester on Thursday. The royal party's first destination was De Montfort University, which until 1992 was a polytechnic. The Queen and the duchess watched a fashion show. Catherine judged a shoe-design competition and the winning pair will be made up for her to wear. After leaving the university, the royal party went to Leicester Cathedral for a service which was described by cathedral staff as a Christian act of worship with "multi-faith elements". Afterwards, they were treated to displays of Bollywood-style dancing and South Asian music in the centre of the city, which now has the highest proportion of residents of Indian heritage of any city in Britain. Diane Wensley, who lives in Oakham, Rutland, was among the crowds which gathered to see the Queen outside De Montfort University on Thursday. She took her daughter and her daughter's friend, who are both nine. "The whole party was smiling the whole time. The Queen and Prince Philip are not young so if they kept that up all day it must have been quite exhausting." Ms Wensley - who also saw the Queen when she was a child - said she was surprised to see such a wide age range of people there, but thought many had turned out just to see the duchess. "People wanted to see the Queen because 60 years is a long time, but there were lots of people saying they wanted to be able to see Kate. I think Kate is quite a draw," she said. "She looked just absolutely beautiful and completely at ease." She thinks the royal family has become "more in touch with the people". "The last time I saw her she was in a car and we went with school if I remember rightly and we were on the road side and I was waving a flag," she said. "I remember standing by the side of the road for a very long time. I remember seeing her wave at me as she drove by. "I remember being excited seeing her in the car. I couldn't have imagined she would get out and talk to people, but 35 years later her she is, getting out and talking to the people around."